Today we released a new version of CamCamX, 1.511, which includes full support for Leopard. 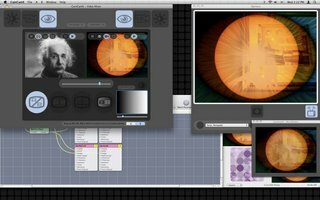 The enabling technology is our innovative Quartz Composer plug-in, which allows the CamCamX output to appear as an image input in any Quartz Composer composition. With this we built plug-ins for Leopard PhotoBooth which allow you to do sophisticated "Picture in Picture" style video mixing directly into Photo Booth, which means you can easily (and cheaply) record live video mixes. For iChat Theater, we've included a file in the Goodies folder which will allow you to "share" the CamCamX mix output with anyone you're chatting with on iChat Video. Simply go to the file menu and Choose "Share a File with iChat Theater", and select the CamCamX sharing .QTZ -- this will send the live mix output from CamCamX to your chat buddy. Keep in mind that both DotMatrix and Qamera also support this functionality - or - you can mix DotMatrix and Qamera output with CamCamX and go nuts with a creative performance over chat. Because all these features are built on our sophisticated camera sharing architecture, it means that you can perform live on video, and simulcast the video stream AT THE SAME TIME, to SKYPE, Yahoo!Messenger, iChat, and almost all web-enabled chats, including Stickam, ustream.tv and mogulus. We've also made improvements in the underlying architecture to support "Fast User Switching". Since Leopard allows two users to be logged in, both with the camera open, we thought it would be good if CamCamX could also be run independently in each session. Back when trying to juggle our release schedule, and before CamCamX could read the ARGB camera inputs sent by Qamera and DotMatrix, we put a little code into the DotMatrix camera rebroadcaster to keep CamCamX from loading it. Well, today, in conjunction with our cool new Quartz Composer plug-ins for DotMatrix and Qamera, we've removed this limitation so that you can now setup Qamera and DotMatrix as inputs in CamCamX and mix them live. In the picture on the right you can see the combo of CamCamX, DotMatrix and Qamera in action on Leopard. Naturally, we test our products on Tiger and Leopard and PowerPC and Intel. As it is to be expected, bugs may escape our awareness from time to time and we sure appreciate it when people tell us about it. It helps us make the products better. NOTE: The following applies only to QuickTime 7.3 under Tiger. It's been something of a challenge tracking the rapid deployment of all the QuickTime revisions, ahem, to say the least. While our Apps are working great under both QuickTime 7.2 and 7.3 (and probably 6.5, although we don't test it), they have made some changes to QT Player Pro that will require an update to all our little virtual cam apps for recording. We definitely want to do this, as the camera output from DotMatrix and Qamera is ARGB with an alpha channel which is something that many VJ's and PRO video nerds will love. If that sounds like you, either use an alternative movie recording App, or downgrade to QuickTime 7.2 -- QT 7.2, which we used primarily during the development of our new ARGB camera technology, works great with both Qamera and DotMatrix - you can record a Device Native 640x480 with an alpha channel and bring it into Final Cut. Etc. 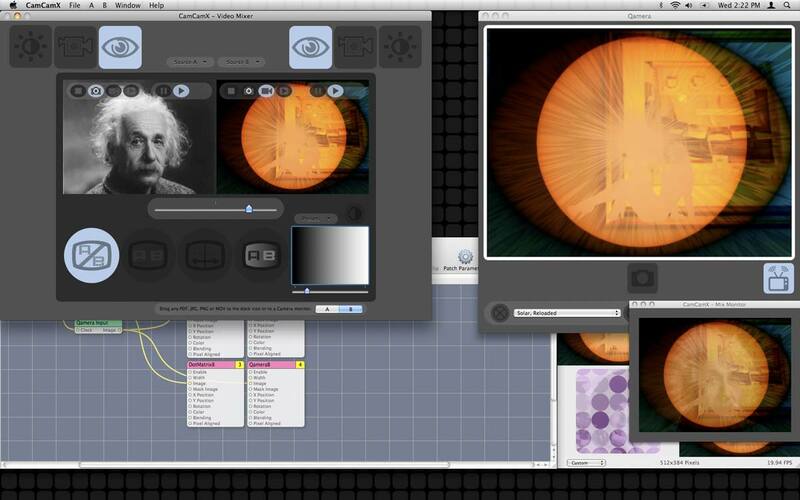 Or pipe DotMatrix into Quartz Composer and have the video texture alpha ready (at least, that's the theory). BTW, we did release a CamCamX upgrade today that fixed a problem preventing MACAM and other third party webcams, including Qamera from working correctly. Now, on Tiger, you have a choice of either starting CamCamX first, then Qamera, or vice versa. On Leopard, with our X5 driver installed ("Leopard-Only.pkg"), it doesn't make a difference. If you have any questions about routing video signals, please send them our way.